Complete your living room furnishings with the impeccably crafted Grand Sofa. Flaunting a splendid profile, it offers rich seating with its generously padded seats, backrests, and rolled armrests. Fashioned to exude traditional-style vibes, this sofa makes for the ideal living room furniture with its neat looks and spacious seats. Very satisfied with quality and reasonable pricing. Beautiful, well built. Love it! Very comfortable sofa! This looks nice and is very comfortable. we purchased the sofa, love seat and chair for our vacation home and furniture fits perfect and compliments our living room. I like this couch but I haven't had it long and I keep thinking it's dirty. Also, when the movers delivered it, I was going to put furniture protectors under it but they advised me I didn't need it because it already had them on. Well I moved my couch and it scratched the floor.. so beware of this. Other than that the couch looks great. I love the couch. It looks great and is very comfortable. The price was also very good. We compared it to other stores and found Jordan's to have the best price. The delivery service was also well priced and outstanding. It was delivered at the right time, and the movers had it in and installed in exactly the right place in minutes. Couldn't ask for more! Great set. Very comfortable and good quality. Just purchased this couch. Needed a sleek couch for our new condo. Comfortable for watching television and reading. Even though it is narrow, still comfy when napping or resting. Very please with the purchase. Great looking and a great value! Very confortable. Perfect for our new Condo!! The store is well organised vsales people are helpfu. The delivery was on time. The delivery men were professional and polite. Everyone loves the furniture. I would highly recommend Jordan’s Furniture Company. Great place, great people, great furniture. I love the color. The price is amazing and the quality seems so much more than what I paid for. The accent pillows are such a nice addition. We use this sofa infrequently but notice we have to adjust the back pillows and seat cushions after use. Not a big deal. We were looking for a comfortable, well built set in a reasonable price range - this set fit the bill. It offers great support, durable fabric - and the sales people and delivery were all great! see how well it holds up over time ! When I ordered these on line I wasn't sure what I was getting. I was so impressed with color, material and quality. Everyone that has seen and sat on these can't believe how nice they look and extremely comfy. Delivery was top notch. Thank you. I bought this couch impulsively and I was really worried that I wouldn't like it. As it turns out, I love this couch. It is very attractive and very comfortable. I also love taking naps on the couch and this is perfect for that. I'm really happy with this purchase! 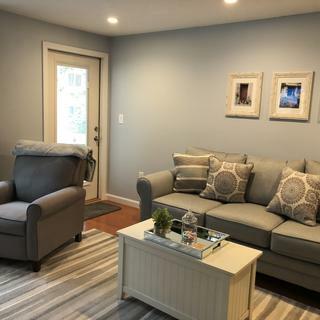 Love everything about this sofa.The color of the sofa and design of the throw pillows are so beautiful adding to the comfortable seating.I made the purchase online but when I saw the actual sofa I was more than pleased. Love this sofa! Very attractive and more important it's very comfortable! Absolutely love this sofa! Perfect size and design! How much is the ottoman? Is the color on the gray side or green? The Ottoman Shown in the Room Scene Image is discontinued and we no longer carry. The fabric on this Sofa is closer to a Grey with bluish tones. The Fusion Furniture Grand Sofa is shown in a color called Grand Mist. The item is not available in special order fabrics and is only available in the color shown on the website.